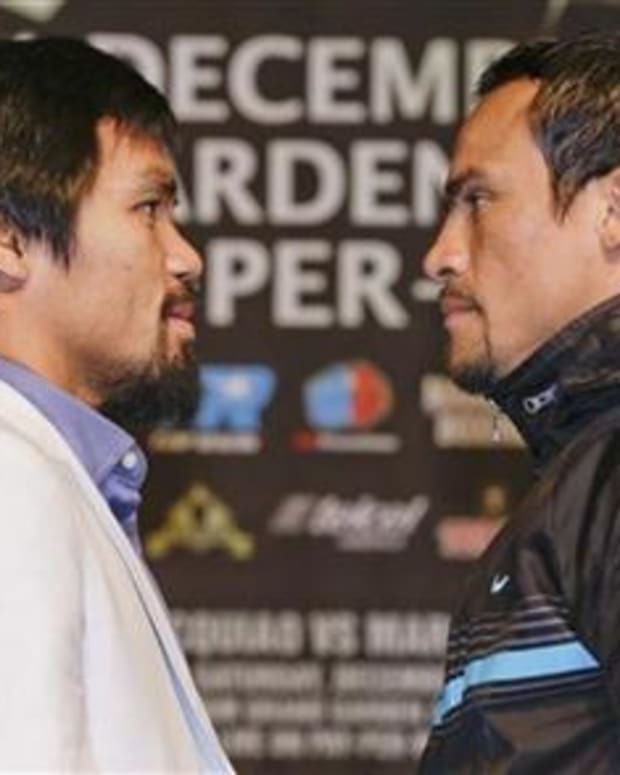 Manny Pacquiao Needs a Rematch Clause vs. Juan Manuel Marquez? Absolutely everyone, everyone agrees that Juan Manuel Marquez has no shot against Manny Pacquiao when the pair squares off on November 12. The debate has now turned to not if, but when Pacquiao will knock his opponent out. So, if there is so much confidence in the end result of this fight, why exactly did Pacquiao and his camp commission a rematch clause for this bout? Yes, you heard that right – they demanded a rematch clause. "There&apos;s no doubt in my mind that Manny&apos;s going to win this fight, but let me just put it this way: How unintelligent would it be if we did not include a rematch clause, just in case of some freak incident," Michael Koncz recently told RingTV. "Yes, there is a rematch clause in there. We have to be protective of Manny just in case some freak things happen in the fight. We have a mandatory rematch clause at the option of Manny." To put things in perspective, Koncz opted to take a little swipe at Pacquiao’s arch rival Floyd Mayweather Jr. and his recent victory over Victor Ortiz. "How many champions have a fight where, for example, you have an ending like the Ortiz fight. Where did his management make a mistake?" asked Koncz. "They made a mistake against Mayweather by not putting a rematch clause in there. It has nothing to do with any doubt as to whether or not we think Manny&apos;s going to win. It&apos;s just smart. It&apos;s just good business." Good business? Sure. Confidence-inspiring? Not especially. Look, accidents happen – we all know this. But to even acknowledge that there is the slightest of a sliver of a chance that Pacquiao will lose to an over-the-hill, past-his-prime, urine-sipping Marquez is almost blasphemous at this point. 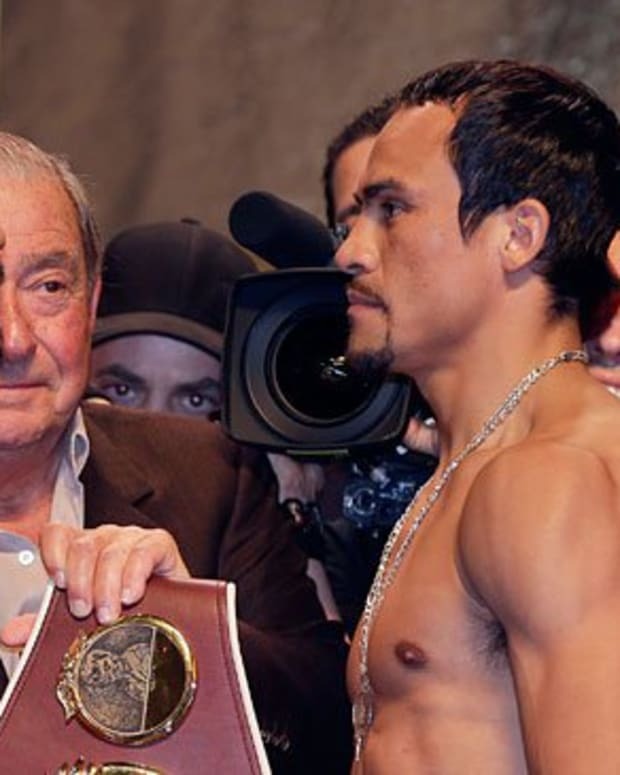 The truth is, while the pair has had some pretty epic bouts in the past, both Pacquiao and Marquez are vastly different fighters than they were the first two times they met. Pacquiao, although mildly past his prime, is still in tip-top shape and a more complete fighter than the one who knocked Marquez down three times in the first round of their draw. The fight, mind you, in which he was robbed of a victory he had clearly earned by a judge who later admitted his mistake. On their second go-around, Pacquiao won in slightly less emphatic fashion, but there was still a case to be made that he earned the victory. And given that there should be no arguments that he won their first fight even if the end result didn’t reflect it, it’s pretty clear that Pacquiao is heading into November with a 2-0 mark versus Marquez despite the latter’s protests to the contrary. Pacquiao will destroy Marquez. It will be a knockout. It will be another in a long line of easy paydays for the Filipino champ. And all he did by including that rematch clause is create an extra billable hour for the lawyers involved because, believe me, nobody including Marquez actually believes he’ll need it.